The J&W MINIX is absolutely ram packed with stuff: you couldn't squeeze another socket in even if you tried. 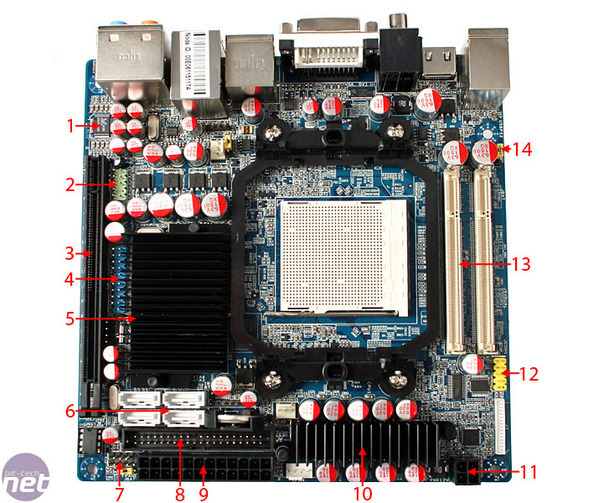 The blue PCB with uniform black and white plastic components looks good as it maintains a style while helping differentiate the components in such a small space. J&W has still managed to squeeze four SATA ports, an IDE connector, a PCI-Express x16 slot and two memory slots on this board, but there are some compromises you should be aware of. The first of these is the most obvious: in order to squeeze dual channel memory onto the board, J&W has had to opt for DDR2 SO-DIMMs rather than the standard 184-pin variety. While this still allows future upgradeability, SO-DIMM memory is generally lower power than standard DDR2, which means that it'll make the cost of ownership a bit more expensive because you've got to source specific components for it. 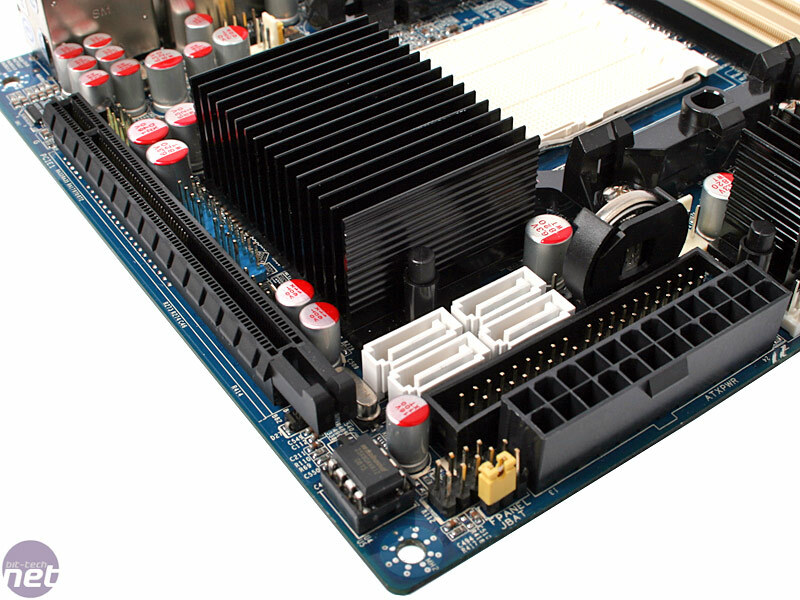 The PCI-Express 2.0 x16 slot is only actually electrically x4 even though it has pins for x8. J&W told us that this was because of the limitation in trace count - x8 or x16 was just not feasible because it would require 8+ layers making it much more expensive. A PCI-Express x4 slot is a large compromise for gaming - it equates to the same bandwidth and means the graphics card won't be running anywhere at its full capacity. 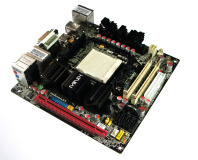 Having said that, given its size and the fact that the CPU socket is limited to 65W AM2/AM2+ CPUs, the designers haven't designed the board as a home for the Radeon HD 4870 X2 (even though technically it can fit and work). Both the SATA and IDE ports are quite difficult to get to nestled between the CPU heatsink and behind the ATX socket - especially if your SATA cables have clips, because getting your finger in to release them is certainly tricky. Thankfully J&W has had the foresight to drop the floppy port though so as not to waste space. The extra pin-outs for the four USB 2.0 ports, the RS232 serial and front panel audio are easily identifiable by colour, but are again mostly nestled between slots, sockets and heatsinks - building this board up requires an art of patience and systematic nature. The front panel pin-outs could do with being colour coded though, because reading the tiny text scrawled on the board is extremely difficult and as men we'd never willingly admit referring to the manual. 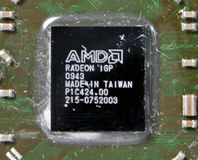 A single heatsink covers both the 780G northbridge and SB700 southbridge, and while AMD chipsets are exceedingly low power having been built on a 55nm TSMC process, the heatsink still requires some additional airflow. J&W warns of this on a little sticker and it will readily overheat causing graphical corruption and lock-ups (as we found out) if it doesn't get some breeze. Those looking to use this in a passive environment are therefore out of luck, but a single, large top down fan covering everything will certainly work to minimise noise. While it would have been unpopular, J&W should definitely have included an additional fan to clip onto the heatsink to assure stability instead of risking frustrated users. Addendum 18th September 2008: After further discussion with J&W we have been informed that retail products are currently shipping with an optional AVC Digital Home Series 4010 DC fan on the northbridge. We were told it was made specifically to J&W specifications and is <25dB. 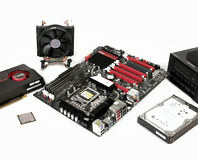 J&W manages to squeeze just three power phases to handle the 65W workload, however it has had to use extremely low profile chokes on the underside of the motherboard and the MOSFETs have required additional cooling too. One Gigabit Ethernet is included for connectivity (the chipset is also on the underside) and while there's no wireless too there are plenty of USB ports to use an adapter. 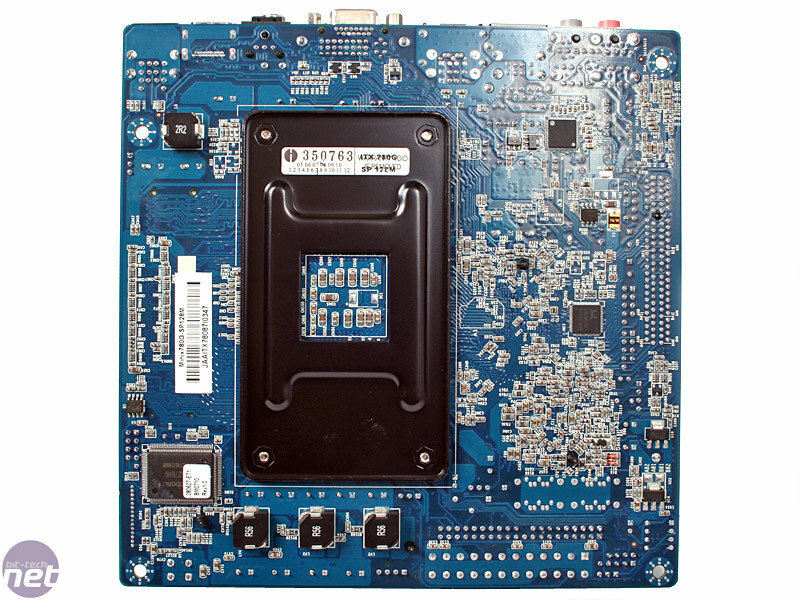 J&W includes the premium Realtek ALC885 chipset too for 7.1 channel HD audio support. This should come with higher quality DACs for better sound quality, and it also includes HDCP audio passthrough, but compatible software is still very limited. 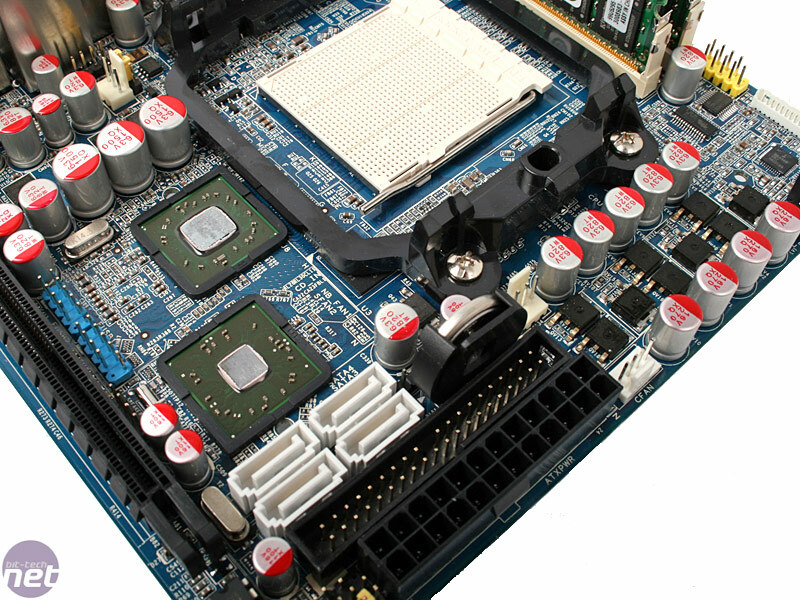 There's no CF slot or mini-PCI slot like some EPIAs include, so you are limited to some expansion choices, however there are plenty of USB ports to compensate and the onboard graphics core is leagues ahead of anything from VIA when it comes to performance. Naturally the board supports Hybrid Graphics and J&W has even managed to squeeze in 128MB of local 800MHz DDR2 memory for the IGP in order to improve performance where it can. We still question its actual usefulness compared to cost of including it - it does improve performance marginally, but no other 780G partner has ever bothered. All in all then, this board is not without its limitations but it's still mightily impressive what hardware and potential performance you get crammed into such a small space.